Construction of Apple’s data center in Reno, Nevada, is well under way according to the local Reno Gazette Journal. The paper reported that earlier this summer, Apple finished building the first phase of the data center — a 2.5 MW, 20,000 square-foot portion — and just recently completed the second phase, which has buildings for engineering support, staff and shipping. The site also now has two new six-story high water storage systems that will help cool the data center and can pump 360 million gallons of water per year, making it the largest privately-owned water system in the state, according to the Journal. Apple plans to use 345 acres of the 2,200-acre Reno technology park, so there will be more construction over the next few years. As we broke the news this summer, Apple is also planning on building a 137-acre solar panel project (called the Ft. Churchill Solar Array) nearby the data center in Lyon County, and the company will also use local geothermal sources for clean power, too. 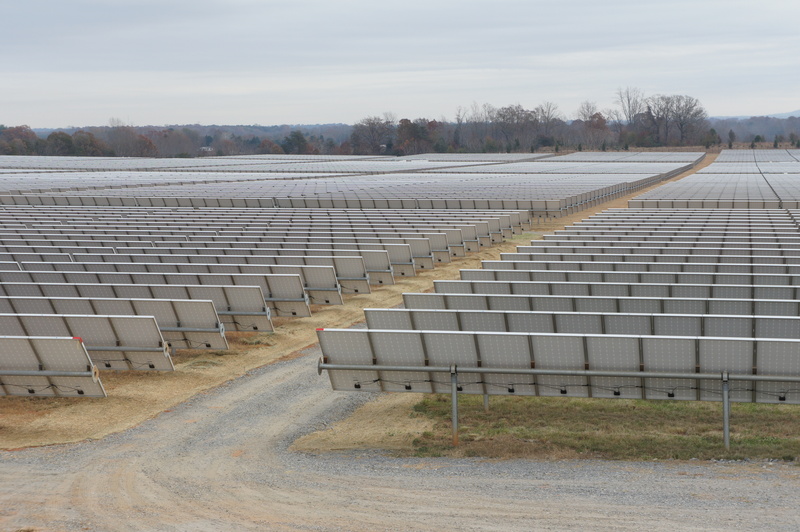 It’s unclear yet if the solar farm is already under construction (to learn more about Apple and solar, read my special report). For the solar and geothermal power in Reno, Apple is working with local utility NV Energy in a unique clean power program, which shows how Apple is looking to work more closely with utilities around clean power. The Reno solar farm will provide between 18 to 20 MW worth of power and the farm will use both solar panels and mirrors that concentrate the sun’s rays up to seven times onto the panels. As goes with most data center construction, the Apple facility in Reno isn’t without controversy. Apple is getting a major reduction of its property taxes — by 85 percent — meaning a loss of a potential $89 million to the area over a decade. And only 35 full-time jobs will be created by the data center. However, construction jobs are estimated to reach 500 during the build-out process, and local construction companies are making millions from the jobs. The Journal also reported that Apple’s property tax revenue will be decent over the years: $1.7 million a year by year six, much of it going to local schools. In addition Apple has said it plans to build a receiving center in downtown Reno, but that project appears to be behind schedule (if it’s still on). But more than the injection of capital for a depressed area, Apple can act as a leader in helping create a data center hub for the Reno area. Apple certainly helped North Carolina attract other data center operators to that area. If the Reno technology park can attract a few others to the area, that lost property tax could be paid back in spades. Anyone know what they do with the 2.5MW of waste heat? They could use it for district heating if it wasn’t such a warm location, or perhaps boost it up using big heatpumps and desalinate water. Now that would be a useful add-on benefit. Just don’t think that a water system that throws away heat with less chillers is sensible. It’s just a smart way of doing something dumb. Hey! I could use a 85% reduction of my property taxes!! Opps! I’m not a multi-billion $ company who makes over-priced toys in China. Apple was supposed to build a receiving center in downtown Reno as part of the “deal”. Looks like they are bagging out on that part. Nut looks like they are the 800 pound Gorilla, they can do what they want, they get the breaks…and if you dont like it you can sue them if you like. What is a ‘receiving center’? Reno / NV Energy must be convinced that there are sufficient positive externalities from a project like this to justify the reduction in property tax. Curious what the rough estimate would be (and in which metric). North Carolina doesn’t get as much sunshine as the southwest. Wow, that looks like an awfully inefficient use of land.